$5 donation requested to help cover costs. Jenell Streeter has a Master of Science in Psychology and a Bachelor of Science in Speech Communication. She is a mother and primary care provider of three children on the spectrum and one typically developing child. She is respected as a skilled case manager and advocate for her children. Jenell has utilized private speech and language pathologists, private occupational therapists, ASD therapists, in-home support and respite providers. She coordinates services, both medical and educational. On the behalf of her children’s education, she participates in meetings regarding IEPs, staff training, problem solving, data gathering, and intervention strategies. In her role, she is busy exploring and implementing treatments and therapies, attending conferences and training seminars, and participating in parent chat groups. Prior to becoming a parent, Jenell taught classes at Portland State University and worked as a research assistant, psychology technician and a consultant. Jenell has recently begun a business, Autism Consulting, Coaching, and Training (ACCT). Whether working with parents, businesses, school districts, etc., the goal is the same: support the growth of those with ASD to enhance their happiness, health and safety. As a parent herself, she understands the need for practical, realistic approaches to solving real world problems and increasing independence. Parents and guardians of ASD Children, bring your questions, concerns, and challenges. Jenell Streeter, M.S. in Psychology (expert parent, mother of children on the spectrum) will be facilitating the group. The goal is for every attendee to have at least one of their specific issues addressed in the session. 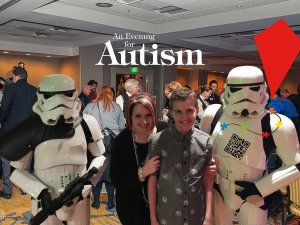 This entry was posted in Autism Activities, Calendar, Lecture, News and Updates, Westside Family and Community Center. Bookmark the permalink.